DEN BROWNE'S REISSUES FOR MAY: TOTAL DESTRUCTION TO YOUR MIND! It’s now over thirty years since the sad death of singer Malcolm Owen led to the demise of West London’s mighty Ruts. Now trading as Ruts DC (as in “Signed DC” on Love’s “Da Capo” album, I wonder?) , since the 2007 death from cancer of guitarist Paul Fox, the core group now comprises original rhythm section of drummer Dave Ruffy and bassist John “Segs” Jennings. The group now look to play a mix of their own new material and old/reconstructed songs - so you won’t hear any retreads of old favourites here. Musically it’s really a case of “File Under Reggae: Contemporary Dub”. Having recorded a “Rhythm Collision” set in 1982 with top reggae producer/remixer Mad Professor, the plan was to work with him again. It didn’t quite work out this time, but its no loss to the sound as seriously hot Brighton dj/producer Prince Fatty/Mark Pelanconi (check his solo work or production on Hollie Cook’s album) enhances his rapidly growing reputation. Other collaborators - mainly on vocal duties - include Tenor Fly, Ngoni, Aynzli Jones and Alabama 3’s Rob Jones. Try a few tracks like “Mighty Soldier”, with some righteous Tenor Fly vocals, “Mix Up” with its swirling dubby smoke rings of sound, “Smiling Culture”, with its restrained but tense look at the still mysterious death of MC Smiley Culture, or “London Dub” and you’ll get the idea. About the only criticism I’d have is to suggest maybe a tiny edit on a pretty long set. Ruts DC are also going out on a UK tour this month, check www.theruts.co.uk for details. Swamp Dogg - Total Destruction to Your Mind: Swamp Dogg’s been a cult name-drop among crate-diggers and soul obscurists for a long time. Although he’d been singing/song writing as Jerry Williams in the 60’s, it was the adoption/creation of the Swamp Dogg persona/brand in 1970 that has defined him ever since. He’s putting out music to this day on www.swampdogg.net “Total Destruction…” in particular was talked of as a great lost classic album, often going for mad money on eBay. So this series of reissues from Alive Records is great news. These three reissues were all recorded in the early 70’s, and are a fabulous mix of old-school soul sounds and values, social commentary, humour and romance. He’s a true Southern soul man like Otis Redding or Al Green, but it could just as well be Cee-Lo Green you‘re listening to, the sound‘s hardly dated at all. Unlike most of his soul colleagues, Swamp Dogg was something of a psychedelic enthusiast, and it’s probably what gives his singing and lyrics the edge that make them stand out in their blend of altered vision and emotional intensity (see also his bizarre self-designed album sleeves). Deeply committed to the Civil Rights movement of the time, Swamp’s able to generate an almost Biblical fervour in his plea for honesty and unity. The trappings adjust with the technology, but the song remains the same. Sometimes likened to his contemporary, Sly Stone, there’s also a bit of Van Morrison in his style, and I’d suggest he’s an absolutely massive influence on the George Clinton bands like Parliament and Funkadelic. There’s been so much fake “Retro Soul” in the last few years - often more about the look than the sound - that it’s great to remember what the real thing can be like. “Total Destruction” (1970) - the album and the song itself - has to be the best place to start. Songs like “Synthetic World” and “These Are Not My People” emphasize the slightly-spaced approach to social issues, before closing with the cheeky “Mama’s Baby, Daddy’s Maybe”. “Rat On!” (1971) is almost as good, featuring “God Bless America - What For?” (which led to him falling out with supposedly cool Elektra records), and a similar blend of social vision with songs like “Predicament 2” and “Do You Believe?”. There’s a nice cover of the Bee Gees’ “Got to Get a Message To You”, and a bit more sass on tracks like “That Ain’t My Wife” and “She Even Woke Me Up To Say Goodbye”. "Gag a Maggott" is the third reissue in the series. "Wife Sitter" is as good as anything on the earlier albums, while other songs like "I Couldn't Pay for What I Got Last Night" and "Choking to Death (on the ties that bind") show what Swamp Dogg meant when he said he thought of himself as a country singer. A couple of fairly routine cover versions of "In the Midnight Hour" and "Honky Tonk Women" make this album maybe less essential listening than the other two albums." Irma Thomas - In Between Tears: Apart from his own music, Swamp Dogg also produced other artistes like Irma Thomas. If you aren’t familiar with her, find her version of “Time Is On My Side” from 1964. This album came out in 1973, and displays her hard-knocks life (four kids by the time she was 19). A string of hit singles in the 60’s had established her name but she didn’t see much of the money. Even at this early stage, she was disillusioned by record labels already marketing her as an “oldies” singer and only interested in making a quick buck. The sound on “In Between Tears” (1973) is classic Muscle Shoals, evoking sultry evenings sweating it out on the veranda with a bourbon or three. The centerpiece of the album is the twelve minute medley of “Coming From Behind” , which starts off with a long Millie Jackson-style rap before easing into Wish Someone Would Care” (and features some stinging guitar from pre-Brothers Duane Allman). “In Between Tears” it is another really strong track, written for her by Swamp Dogg and Doris Troy. As with his own albums, there’s a real sharpness and clarity to the music with its tight brass arrangements, clipped choppy guitar rhythms, and drum’n’bass flowing like the Mississippi. “Songs like “She’ll never be your wife” and “these four walls” are equally powerful. Sure, she never strays far from the feisty “Woman Wronged” soul style, but with a voice and arrangements like we get here, who’s complaining? There’s an interesting little sleeve note from the Dogg himself too, where he finds everyone from Aretha through Alicia Keys to Adele to be inferior to Irma Thomas. It’s also just about worth the purchase price for the cover art alone - a masterpiece of early 70’s naïve art - a strange mixture of the weird and the obvious. A purple-clad Irma floats beatifically in meditation pose, while giant eyes weep in the sky behind her. She’s in between tears, y’see? 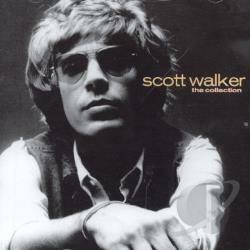 Scott Walker - Scott: The Collection 1967-70: There’s also a Scott Walker reissue set, “Scott: The Collection 1967-70“, made up of his first five albums and including classic songs like “Mathilde”, “Jackie”, “If You Go Away”, “The Seventh Seal” and “Til the Band Comes In.” It comes in CD and vinyl formats, original artwork, and a booklet of essays and interviews.